The beginning of 2011 will mark the end of our second year of being live on the Internet, and once again, we are very grateful for the support of all of our users. We particularly are thankful for our full members who allow us to continue to grow the site. And grow the site we will! We have several exciting things planned for Signing Savvy in 2011. From all of us at Signing Savvy, we wish you joy and happiness during this holiday season and all the best in 2011! This site has been such a blessing.I am an older student of ASL and Interpreting and would not be as far as I am if not for Signing Savvy. Thanks for be there for all of us. A wonderful site. I no longer study ASL actively, but since I live in a very Deaf-friendly city, I refer to Signing Savvy often. THank you for sharing this story about Helen Keller. It's amazing! I just started studying ASL on my own. I love this site. I'm so glad I found it. As the school year approaches, we want to let you know of a few things we have recently done on Signing Savvy particularly for teachers and students. Many sign language teachers and professors are using Signing Savvy to create word lists (aka, vocabulary lists) of their lesson plans and then sharing them with their students. This allows the students to use Signing Savvy's online flash cards and quizzing features to quickly reinforce what they learned in the classroom from home or wherever they have access to the Internet. As a result, we now have hundreds of shared word lists. We have had the ability to search shared word lists, but even this becomes tedious if you always want to return to the same shared word lists. We've added functionality so now you can bookmark word lists that you want to return to often. Just view a word list and click the ADD BOOKMARK button. The list of your bookmarked word lists will show up on the Shared Word Lists page. If you want to see all the shared word lists created by someone, you can friend them. For example, a student might friend their teacher or a study partner. Then whenever the teacher or study partner creates a new shared word list, the word list will show up in the student's friends list. To add a friend, first, click on the author's name of a word list to see all of their shared word lists, then click the ADD AS FRIEND button. Just like bookmarks, the list of your friends word lists will show up on the Shared Word Lists page. Note: Of course, you are only allowed to see word lists that are public. Private word lists are not viewable by anyone other than the author. With this in mind, teachers are starting to integrate Signing Savvy into their courses. In some cases, they are replacing or complementing the course textbook with Signing Savvy memberships. We have received several requests from teachers for a membership duration that fits the duration of a semester and the pocketbooks of their students. We have done just that! We now offer a semester long (4 months or 16 week) full membership option for $24.95. That is much cheaper than most textbooks. We have also just started a "recommendation program." Teachers (or anyone else) can set up an account on Signing Savvy and recommend Signing Savvy to their students (or whomever) by providing a special link. When the link is followed to Signing Savvy and the individual becomes a full member, they are automatically connected (see friending above) to the teacher's account so that they can see their shared wordlists. In turn, the teacher is rewarded with additional free full membership time to Signing Savvy. Recommendations are easy to give and are fully explained in the FAQ section of our website. This one is not new, but many are not aware of it. If you are part of an institution, such as a school, college, government agency, non-profit, or corporation and would like to offer memberships to your students, members, or employees, Signing Savvy has an excellent way to do just that, called Bulk Membership Purchasing. With Bulk Membership Purchasing your institution can purchase multiple Signing Savvy memberships at a discounted price, then assign and manage those memberships. For Bulk Membership purchases, we also accept purchase orders. If you are interested, learn more on the create proposal page! At Signing Savvy, we've had a pretty productive summer! We're happy we've been able to rollout several new full member features (described above), a new design, and have spent time in the recording studio so we could add many more signs to the dictionary. We hope you enjoy the new features! Great options! Good work. Thanks. Keep it up. I really like the new lay out, features and design... thank-you! I WOULD LIKE TO KNOW WHAT KIND OF INSTITUTE IT IS THIS, BECAUSE I'M VERY REALLY INTERSTED IN BEING A MEMBER OF THIS, BUT AT THOSE DAYS NO ONE IS 100% CONFIDENT. ALSO I HAVE EXPIRIENCE LOSING CONFIDENCE THROUGH INTERNET, BUT I WANT TO BE A MENBER OF THIS. THANKS! We have been working hard this summer on a redesigned version of the Signing Savvy website. We are happy to make it available as of today! The new design refreshes the look and polishes the functionality of Signing Savvy while not being so different that you have to relearn how to use the site. One of our goals was to take advantage of some of the newer web technologies to make a better user experience. However, if you are using an older browser (such as Internet Explorer 6), you may need to upgrade to take advantage of all of these features. Check out the FAQ for system requirements. We have tested the site internally but your computer configuration likely differs from ours. If you encounter any problems with the new site, please contact us and let us know. With the new design as our foundation, we plan to add in several new features to the site over the coming months. As always, we also continue to expand the dictionary of signs and add blog posts. Great, wide screen layout - love it. So modern and easy to use. We have not had time to update the video tutorials yet, so they are still the old design. However, you can easily translate the old design to the new. We will get them updated soon. It seems that in the Video Options (small, medium, large) -- "large" is smaller than it used to be. Could you possibly make "large" a little larger? Thank you! And thank you also for this great site; it is a big help as a supplement to my ASL class! Actually the large video is the exact same size as before. It may be a perceptual thing as rest of the page is larger. One nice thing about the new design is that the large video is actually larger when you go full-screen. Interesting, that "visual perception"... sometimes our eyes are fooled. Great new look and so much easier to look at and to read! Thanks. What browser and version are you using? It seems to work fine on most. I discovered the password issue was with Internet Explorer only. It is now resolved. Thank you for the password fix. Now I cannot find a button to log out. I have IE8. The logout button now shows properly on IE. Thank you! I am enjoying the new layout and I appreciate your quick response to my questions/concerns! The iPhone plays video full-screen. Therefore it prevents auto-play on video, or it would always take over the screen when you get to a web page. This is a built-in feature on the iPhone, not something we do on Signing Savvy. Therefore, on the iPhone, when you get to a page with video on it, just tap on the video to have it go full-screen and play. NOTE: This is just the iPhone and iPod Touch, I am guessing due to the smaller screen size. Video on the iPad autoplays just like it does on a computer. Great look and improved features. Thanks for providing us this site with the new features. Major error in your program. Will not take my credit card when I know it is good. Make sure your billing address is the same as the billing address of your credit card. The bank checks for this. This is the most common issue with a valid card not going through. Fourth of July Signing Celebration! Signing Savvy wants to help celebrate Independence Day by offering a 7/4 celebration. You get a SEVEN-day trial membership FOR-FREE! Check out the membership features like LARGE video, ability to build your own word lists (and view other members' shared word lists), quiz yourselves, as well as the one of a kind print feature! To access your trial, login to your account (or create a registered guest account if you do not have one) and go to the trial offer page. Happy Fourth of the July from Signing Savvy! What a great offer! As a hearing person this is my main source for signs and tips. Thanks for your work. We are using YouTube to get out video tutorials on the features of the site. If you have not watched them, I highly recommend you check them out to make sure you are taking full advantage of the features the site offers. We are using Facebook to build a community around the site. Please friend us if you have a Facebook account. We are using Twitter to tweat about sign language and related news. Please follow us if you have a Twitter account. We are using Digg to help promote the site to others that may not yet know about it. Please Digg Us! We are also using StumbleUpon to help promote the site to others that may not yet know about it. Please StumbleUpon Us. We have had a RSS feed of our blog in place for some time. You can connect to it from your favorite RSS reader. We have little icons at the bottom of the home page for quick access to these social networking sites. We are still exploring how best to make use of the social networking sites, so feel free to give us your thoughts. We want to build a strong community around Signing Savvy and the signing community. I did "friend" you and have provided your link via my yahoo account as well. Your site is so organized and one can easily navigate through all the features you offer. 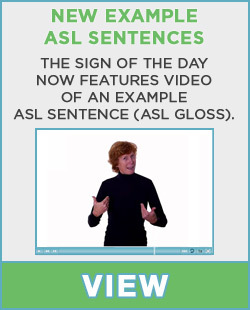 In my opinion, you have the best site for an ASL novice such as myself!